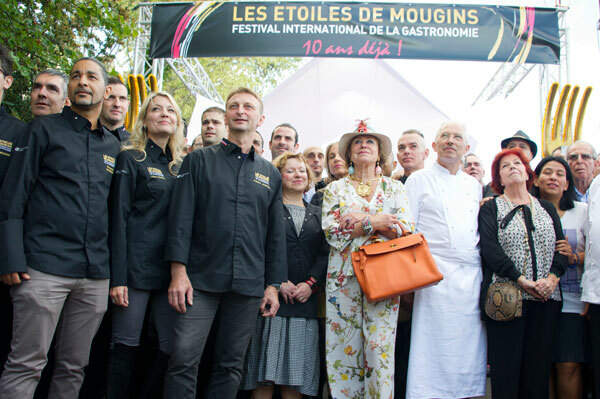 The 10th edition of Etoiles de Mougins, which took place from September 18 to 20, 2015, brought together the chefs from around the world to pay a culinary tribute to Roger Vergé. 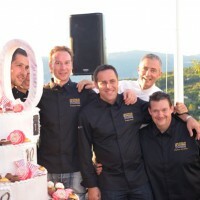 Each year, the Etoiles de Mougins turn for three days the village of Mougins into a large open air kitchen where the greatest world’s chefs prepare, cook and share recipes that make their reputation with the general public, communicating the love of a profession and a passion. 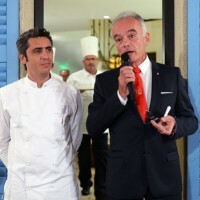 The tenth anniversary of the Festival of Gastronomy and the Art of Living was placed under the auspices of Roger Vergé, celebrity chef with five stars, whose Cuisine du Soleil contributed to the gastronomic reputation of the village. Since 2006, Mougins, the finest and most authentic snail-shaped village in the French Riviera, becomes for 3 days the global star of gastronomy by hosting the world’s top chefs. 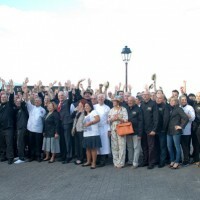 The overwhelming success of this event has enabled the village to gain acclaim by becoming the Capital of Gastronomy and Arts de Vivre in the French Riviera. Birthplace of celebrated chef Roger Vergé, who picked up in record time 5 Michelin stars and dragged in the wake of his immense talent an entire city which will become, in 1992, the most starred in France. This great Monsieur of gastronomy, who died in 2015, is considered to date as one of the champions of French cuisine, but also the initiator of the revival of Mediterranean cuisine, that he called the cuisine of the sun, exalting authentic products from the south and vegetables gorged with sun. The owner of the Moulin de Mougins and L’Amandier formed under his leadership many famous chefs like Alain Ducasse, Jacques Chibois and many others. All worked in Roger Vergé’s kitchens and their work is now recognized around the world. 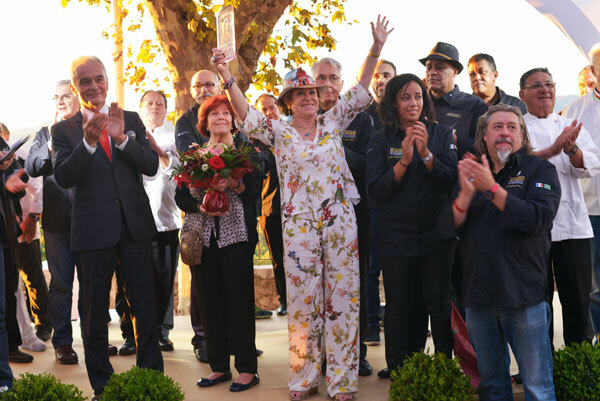 The opening ceremony was attended by many chefs and journalists from around the world, including the New York Times and the Wall Street Journal, as well as Roger Vergé’s disciples. Richard Galy, Mayor of Mougins, awarded two trophies of exception: one to Denise Vergé, the wife of the great chef and godmother of this tenth anniversary edition, accompanied by their daughter Cordelia, who came specially from Boston. The other was awarded to Yanou Collart, the public relations “popess” whose carrer was closely linked to the promotion of the greatest chefs from the Gotha gourmand. In his opening speech in the presence of Denise Vergé, the mayor of Mougins Richard Galy recalled that the city was working at her husband’s side for more than a year to develop this tenth edition of Etoiles de Mougins and presented the program and the chefs who come to honor him. And all came from France or elsewhere, in gratitude mingled with admiration. Besides, the famous chef of La Bastide Saint Antoine in Grasse, Jacques Chibois, said with his usual smile that thanks to Roger Vergé, he discovered the olive oil! All wanted to work with the maestro of the kitchen, even though the work was hard and the hours countless. Denis Fetisson, who had not the chance to work with the master, was glad to be the guardian of his cuisine du soleil and said he was very honored to have the duty to perpetuate his memory and his soul at L’Amandier and La Place de Mougins. He then thanked Denise Vergé for having transmitted such a tool of knowledge and gastronomic perfection. 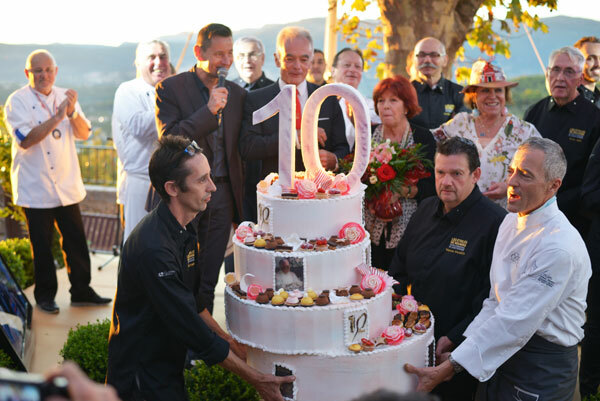 Les Etoiles de Mougins are already 10 years old. 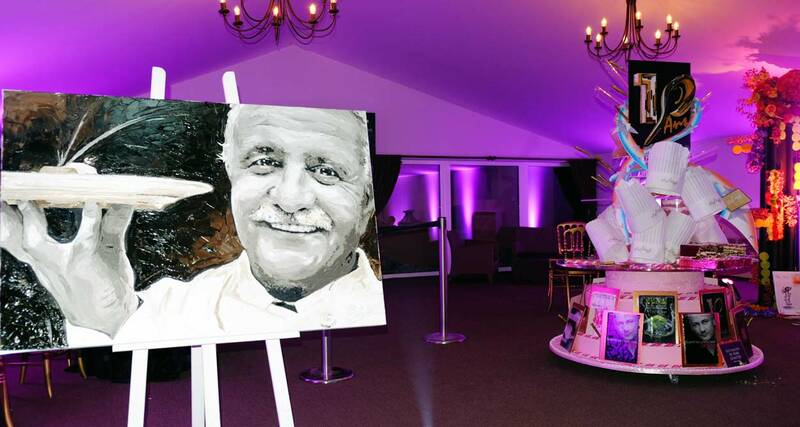 How time flies, and how not to remember that in 2006, during the first edition of the Etoiles de Mougins, the town decided to pay tribute to the chef who did so much to have his town glitter by dedicating the premiering of this haute cuisine festival. The edition was highly acclaimed, as the public and hundreds of chefs then were present. The closing ceremony that followed was an incredible emotional moment in the memory of all those who lived it. In the heavens, a star never dies. Roger Vergé’s face and talent will remain forever engraved in our memory. The master of gastronomy is always present among us to honor this nice milestone thanks to the presence of his wife Denise, godmother of the 2015 edition. It was Emile Jung, former chef of the Crocodile in Strasbourg and three Michelin stars, who proclaimed open this 10th anniversary edition of Etoiles de Mougins. The Gastronomy Festival opening ceremony was closed from the top of the terrace of L’Amandier de Mougins and festival goers could admire the superb fireworks in honor of Roger Vergé and 10 years of Etoiles de Mougins success.